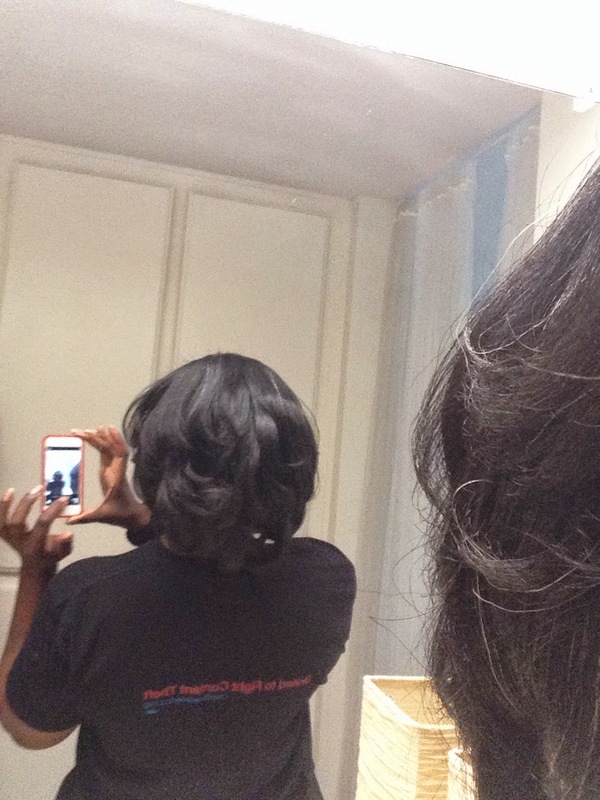 Nicole J. Butler: "Living Truthfully": I've straightened my hair. If you saw the photo in my last post, then you know that I've straightened my hair. With maybe 3 exceptions, I've worn my hair in it's naturally curly glory for about 15 years. I've worn it buzzed, long, short, dreadlocked, twisted, untwisted, fro'd, braided, dyed, bun, phony pony, bantu knots... you name it. I've done everything except relax it or weave it. My hair is thick, grows like wildfire, and as it grows, the time required to care for it also grows... which is why I always cut it when it starts getting too big. PLUS I have a lot of allergies & sensitivities, so I can't always put the latest & greatest product on my hair. Long story short, I let my hair grow, and didn't give it the care that it needed. This resulted in single-strand knots* all over my head. At first I tried to hunt them down with a little pair of scissors, but they were EVERYWHERE, so I decided to blow-dry my hair straight so that I could see exactly what I was dealing with, and snip off the offenders more easily. All that roughness in the back is DAMAGE. I blow-dried my hair, and saw that it was far worse than I thought: multiple splits up the hair shaft, knots, tangles, and rusty-red tips (from a home dye job) all over. I assessed my options, and, because I didn't want to go back to a DIY TWA (however cute it was), I decided that I needed to put my head in the hands of a professional. I didn't want to pay the "curly hair doctor" (though wonderful) $200 to fix me, knowing that once my hair got past a certain length I'd probably have this problem again, and I was ready for a change anyway. So I read Yelp reviews like crazy, found a few salons that I thought I might be able to trust, and called one. I hit the jackpot, y'all. The stylist didn't just "do" my hair, she "cared for" it. She got me in quickly, I wasn't in the salon all day, she didn't charge me an arm and a leg, conditioned it well, didn't take shortcuts, didn't cut off as much as I was sure she'd have to cut, didn't burn me (! ), and didn't try to upsell me on expensive services that I didn't want anyway. She hooked a sista up. Yesterday I had my first audition of the year, and the first I can ever remember having with my hair straightened (though it was in a ponytail). I'll have to get new headshots now, of course, and I'm not making any declarations about whether I'll wear my hair straight forever or not (I seriously doubt it), but right now, the plan is to wear it straight, keep it healthy, and see how long it grows before it gets on my nerves again. But I do love me a good bob haircut, so that will forever be an option. *Single-strand knots (also called "fairy knots" because they are so tiny that it looks like they were tied by a fairy or somesuch) are tiny knots in a single strand of hair, and it happens most frequently in curly, fine, or dry hair. Here's more info on them, but basically, they catch on one another, cause tangles that look like a 405 Freeway traffic tie-up, and can leave you with a wretched, raggedy mess. Plus it's just not a barrel of fun to have KNOTS in your hair.